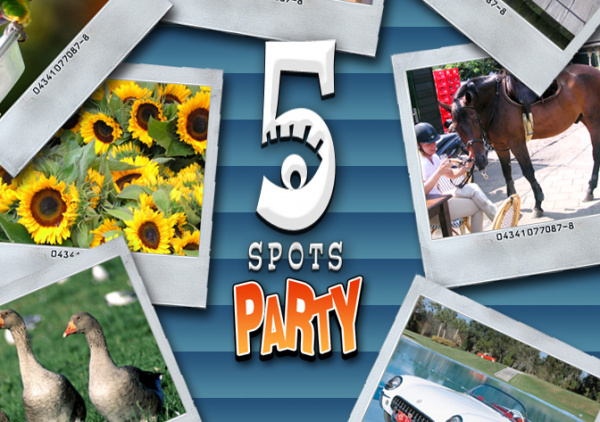 5 Spots Party is based upon the tried and true pen and paper game "Spot the Difference," a staple of children's activity magazines since forever where the object is to compare two pictures (usually drawings) and identify a set number of differences between them as a means of passing the time. This game originally appeared on the PC where it had the top spot on the Real Arcade website for a few weeks, so how does the WiiWare version stand up? Starting the game you're treated to the big, bright bouncing colourful menus you'd probably associate with any casual gaming title designed with broad appeal in mind. In the main menu there are three game modes to choose from, records to view and the creator credits. The three modes are the main game, amusingly called Super Fun Classic, Find the Monkey and Leisure. The three modes have their differences, but all involve spotting five things out of place in a series of photos and clicking on them using an on-screen cursor controlled by the Wii Remote pointer. Super Fun Classic is the main game mode. It's a progressive game where the object is simply to spot five differences between a pair of otherwise identical photographs. The control mechanism is rather clever with the player controlling two cursors moving over both photos in the same area simultaneously. This not only saves moving the Remote pointer back-and-forth, but makes it easier to focus on specific areas. The cursor on one side is an arrow and the one on the other is a circle which aids in precision clicking. This is rather important because making an invalid selection reduces the time left to complete the puzzle; run out of time and it's game over! Click on differences using the A button and if you get stuck you can use a "joker" by clicking B, which will reveal one difference. You get five to start and earn an extra one every 10 levels. You might think that this would be unnecessary -- after all this is normally a children's game, but some of the differences can be rather difficult to spot; especially since you're looking at altered photographs. The more devious photos have differences in out-of-focus areas, though these never feel unfair and can be spotted by the sharp-eyed even given the limitations of the Wii's maximum 480p resolution. After your game ends you're prompted to input your initials which are recorded with your score in a local leaderboard. There's a separate leaderboard for each game mode with replay incentive being focused around getting a better score. Find the Monkey is another progressive game that uses a single photograph with the goal being to spot hidden "monkeys" (some are actually great apes, but we'll let that slide). Seems simple enough, but this game is actually harder than Super Fun Classic because the monkeys are a mix of photo images, cartoon decals, monkey parts and black or white silhouettes. Some of these can be extremely unfair with a brown curled monkey tail being hidden in a brown part of a photo or a silhouette against a matching colour background. This wouldn't be quite so bad, except there's no jokers in this mode; if you get stuck it's game over as you vainly look over parts of a brown photo for a semi-transparent brown monkey image and wait for time to run out. Once you become familiar with the set of images used this gets a bit easier, but the underlying feeling that the game is playing dirty still lingers. Leisure mode removes the time limit and tracks time elapsed for scoring purposes only with mistakes adding 10 seconds to the clock. 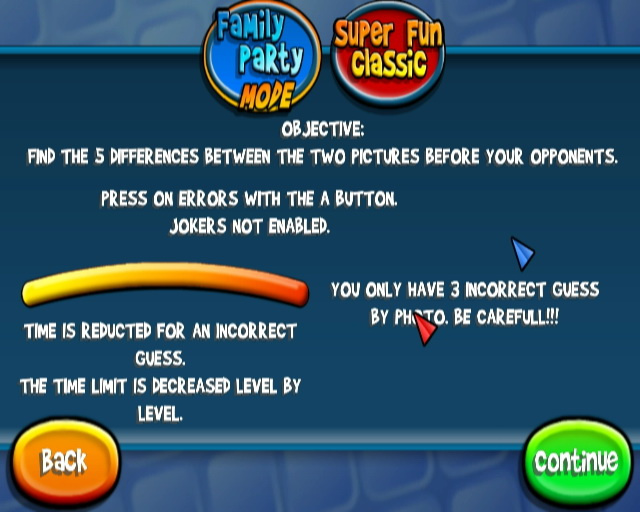 Gameplay is the same as Super Fun Classic and there are five jokers, but there are only five levels to clear with the goal being to get through them in the fastest time possible making it good for a quick play now and then. The quality of the photos is quite good with a wide variety of neutral subjects being covered including wildlife, street scenes and even baby photos. The Operations Guide for 5 Spots Party claims 333 photos are available; after encountering the same photo twice in as many games during the same play session -- albeit with variant differences -- you may wonder if there's a bit of creative math being used in coming up with that photo count. The developers do seem to have missed a trick in not providing a mechanism for selling additional photo packs; if the technology was included for users to make use of their own photos that would also be welcome. Audio is forgettable bordering on annoying with sound effects consisting of the 3 Stooges Library of boings, bell rings and horn honks every time a difference is spotted or the Hurry Up! message flashes across the screen to let you know you only have 1/4 time remaining. The music consists of a 10 second endless loop of "Whistle While You Work" combined with "Knick-Knack Paddywack" that might get old quickly. Without any option to adjust the volume of music or effects, muting your TV may be the best choice should patience wear thin. As noted the photos present a mix of easy and challenging differences to spot, but there's no linear progression and no selectable difficulty. You can have a couple of dead easy ones and then a really hard one or start out with a fairly difficult one; it's completely random. As you progress through levels in the first two modes the time limit counts down faster and faster. This cannot be adjusted; nor can you change the number of jokers available to raise or lower difficulty. All of these things seem like basic options which would extend the appeal of the game and are glaring in their omission. Whilst the single player game provides a good experience the same cannot be said of the multiplayer game. Both Super Fun Classic and Find the Monkey can be played with 1-4 players with the object being to spot more differences than everyone else through a series of 5, 10 or 15 photo pairings. In Super Fun Classic each player only gets one cursor, which makes spotting differences more difficult; especially since players will naturally have a tendency to focus on only one photo. Since many of the differences involve things missing from one photo which are present in the other players will need to click on empty space to identify the spot. This results in false errors when trying to select a difference if your cursor tip is outside the invisible boundary surrounding the spot; given each player has a limit of 3 mistakes before locking out their Remote for the level frustration is bound to ensue. The fact that the gameplay in both modes is the same for single and multiplayer makes the latter feel like playing a solitaire card game with additional players: the modes have been tailored for a solo play and despite the game's title, they don't work well in a party atmosphere. 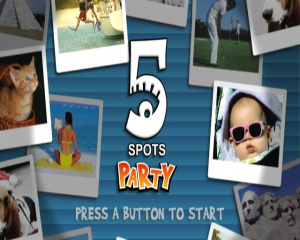 The concept behind 5 Spots Party doesn't sound terribly compelling, but by including a clever control mechanism, a timer and some rather challenging photos Cosmonaut Games have managed to make a decent budget WiiWare title out of a game that is mostly played by kids waiting for food orders in family restaurants. The lack of any difficulty options and the lacklustre multiplayer mode does not do the game any favours, but for many it could provide a nice little diversion at a low price. This looks pointless I don't need WiiWare to "spot the difference"
Glad to see it got pretty good score. I'm telling you... if you have stereogram viewing skills, and can focus two images on top of each other easily, you can immediately spot all the differences between the photos, with the only delay being how fast you can actually select them with your pointer. Look at this screenshot posted in the article, for example, and try to focus the images on top of each other. You'll see that all the differences are immediately apparent, due to their flickering in your vision. I knew it was going to be shovelware! @SuperSonic1990 Except the review didn't say it was shovelware!!? A 6/10 is by no means a poor game if you read the review policy. Sure it is flawed in several areas, but that doesn't mean it is poor. I know quite a few 6/10 games that I've enjoyed, come to think of it. I wouldn't have bought it to be honest, but I was pleasantly surprised as I hope comes across in the review. @SuperSonic1990 The Scoring Policy says that a 6/10 rated game is "a game that you shouldn't rush out and buy without doing your homework. While you'll want to approach this with a degree of caution, you may still really enjoy this game. A good example of a 6 is a lazy sequel or a game that doesn't innovate but doesn't do anything wrong. Other games with a 6 may be flawed in crucial areas." This scoring policy is confusing me compared to gameinformer's, because 6 is generaly below average, and 5 is poor/bad. Guys, just ignore SuperSonic. Like I said before, he only considers a game "good" if it gets an 8/10. Anywho, I'll probably give this a go when it comes here. Glad the game did decently. But I heard the music a bit in a video and seriously, I can see it getting annoying very quickly. Playing my own music FTW. I might get this for my lil nieces, could be perfect. Can't believe I might actually download this. I enjoy this style of game for a nice way pass some time. Only 500 points + a leader board! Actually seems like a bit of quick fun. Kinda reminds me of the spot the Miis on the Wii Play disc, personally I enjoy that kind of thing. If I got 500 points left over I might actually get this. Shovelware? What the hell you smoking? @Supersonic1990- shovelware? You kidding? This game can be actually a good game to others, and you are considering it shovelware? You got to be joking! 500 points for a spot the difference game? Well it's not like they can go any lower. Wow, that would be pretty awesome if I were 8 years old. There goes KS8 justifying another game! Just kidding... It might be all right, but I never plan to get it. I thought it was good. Multiplayer is great. 7/10. One of the better casual titles.